Eat Your City: Looking back at our favourite foodie things this year: Part 3 random tasty eats in Hawaii! Looking back at our favourite foodie things this year: Part 3 random tasty eats in Hawaii! Starting with the most important meal of the day - the first one! Dreamy soft fluffy macadamia pancakes and waffles from Egg 'n Things with lots of pineapple/guava/coconut syrup of course! 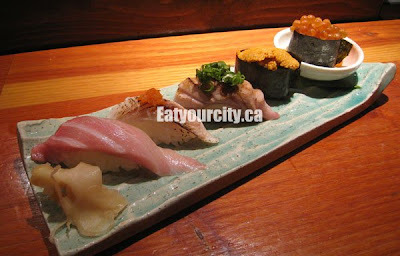 Indulging at an epic omakase menu at Gaku.. so much so that we needed to have part 1, part 2 and part 3 posts to encompass all the yummy food! From an all day self-food tour of Oahu (and invading a day of KimChee's honeymoon in indulge in our passion of eating! ), we all loved Fumi's butter garlic and spicy butter shrimp! Hank's awesome gourmet dawgs - and meeting Hank (made the visit extra awesome).. if a bacon wrapped deep fried dawg isn't pretty awesome already. Will haveta return to try the lobster dawg on a Saturday someday soon! A visit to Oahu isn't complete without stopping by Matsumoto's Shaved Ice!! And going numerous times to eat the Dole Plantation's infamous fresh pineapple whip!